Please note that on Windows Phone and Windows 10 Mobile it's not possible to detect CPU directly due to the strict sandboxing that is enforced by those operating systems. So both the legacy AIDA64 Windows Phone 8.1 app and the new AIDA64 UWP (Universal Windows Platform) app have to rely heavily on their built-in hardware databases. Which in your case doesn't seem to include the device in question. Please submit a report from the About page, and we will add your device to the hardware database of the AIDA64 app, and also fine-tune the CPU detection module to provide more information on your SoC. If you need further clarification on how the AIDA64 apps work, please feel free to ask either here in the public forum, or in private message. As for the Lumia 920 issue, please let me know what operating system does it have installed. The New Windows Phone is XiaoMi Mi4ï¼ŒMS decided to include Mi4 in the Insider Program in China exclusively as Joe Belfiore mentioned on twitter before. 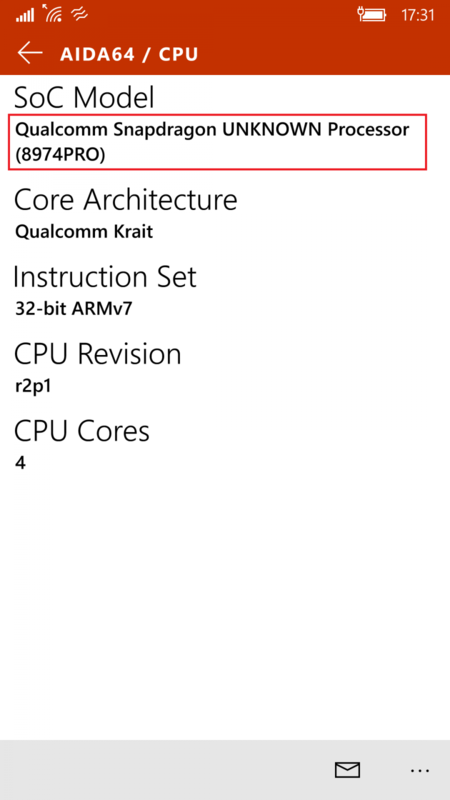 Lumia 920 is on 10581 too, and please notice that Samsung ATIV S GT-i8750 also have the 8260A CPU. I'd like to know how AIDA64 actually works, do you have any public documentation on that ? Thanks for the info, we'll try digging deeper to find where the problem might be. It's not easy, since we don't do anything special on the Windows page, and it works under 10581 on our test devices (Lumia 535, Lumia 930, and various PCs as well). BTW, since another user reported similar crash on the Windows page, with a Lumia 930 running Windows 10 Mobile Preview, and since with a similar device and similar Windows it's working fine for us, I'm leaning towards putting the blame on Windows 10 Mobile Preview. No, we don't, but I'm happy to explain the inner workings of our app, up to a certain degree. BTW, on your Lumia 920 did you perform a device reset after upgrading to Windows Mobile Preview Build 10581? We've now tested it with 3 different devices, and as I've suspected, it's a platform issue. It comes up only on certain devices -- and not all devices --, because the Windows 10 Mobile Insider Preview upgrade wasn't performed properly. If you upgrade from WP8.1 or another Win10 Preview, and you don't perform a device reset (Settings / System / About / Reset your phone), then all kinds of weird things may happen. Now we've done the improper upgrade flow on 3 devices, and all 3 devices crash on the Windows page of AIDA64. While previously, when we performed the "Reset your phone" step after every preview build upgrade, no such crash happened on the same devices of ours. I of course understand that it's not easy to perform such reset operations on a device in use, but if you skip that step, Win10 preview builds will not function 100%. We will try to come up with a workaround in the next AIDA64 app update. We've issued an update to the AIDA64 UWP app in the Windows Store, and it's already available for download. It includes the mentioned workaround to avoid the crash on the Windows page, and also the necessary tweakings about your Xiaomi device. Thatâ€˜s quickï¼Xiaomi CPU info is corrected now, Thank you. Do you have any plan to add more features to AIDA64 than just fulfill the database from varies kind of windows phones? By the way, can I have a email on AIDA64 UWP working machanism ? Thatâ€˜s quickï¼Xiaomi CPU info is corrected now, Thank you. Thank you for the feedback. And yes, feel free to send us an email with your questions.